After the air we breathe, safe drinking water is the most essential human need, and each day, over 50,000 community drinking water systems provide treated (finished) drinking water to over 300 million Americans. One of those systems is Louisville Water Company in Kentucky, which delivers over 115 million gallons of drinking water to nearly 1 million people daily, and where I worked for 30 years until retiring in 2004. Even by then, the “Louisville pure tap® Campaign” was already 7 years old, trademarked, and a huge success. In commemoration of the American Water Works Association’s (AWWA) Drinking Water Week, I wanted to share some of my experiences with this unique enterprise. A program that recently began celebrating its 21st anniversary and that is again in the news as a model for other U.S. drinking water utilities. By multiple accounts, including from peers, regulators, and especially customers, Louisville Water has been hailed as a premier community water system, winning multiple taste tests for its Ohio River-sourced water. By the mid-1990s, however, mounting negative publicity about tap water quality and taste, combined with aggressive marketing by bottled water companies and home water purification systems manufacturers, began taking a toll on consumer attitudes about tap water. Yet as public perception decreased nationally, our actual (measurable) water quality was reaching new heights. As the utility responsible for providing Louisville and surrounding counties with a safe water supply, we looked for an innovative way to both highlight our product—treated tap water—locally and to help restore opinion of community drinking water systems nationally. Armed with a great-tasting product and solid market research, the Louisville pure tap® campaign was launched in 1996, trademarked in 1997, and grew by leaps and bounds. We initially decided to focus on the only real difference between bottled and tap water—the bottle—with an eye toward something fun that captured the attention of young and old alike. Approval of the initial design wasn’t unanimous… I voted against it! Fortunately, our outreach staff won the day and the pure tap® label was born. Over 40,000 bottles were distributed at local community events during the first full year of the campaign alone. In fact, the demand was so great that in 2001 we opened our own bottling line and introduced 8-ounce bottles. By giving away both filled and empty bottles at community events, and in conjunction with expanded education and outreach activities, Louisville Water Company was able to remind our customers that tap water is safe, low-cost, high-value, and of course—tastes great. By any measure, the Louisville pure tap® brand has been a tremendous success, twice winning the distinction as the “best-tasting tap water in America” from AWWA. But an unanticipated thing happened along the way: Customer research showed that the tap water inside the bottle was sometimes seen as a separate product from the water coming from every faucet and fountain in and around Louisville. The focus on the bottle was overshadowing the product inside. And as a company committed to environmental stewardship, Louisville Water decided in 2002 that the disposable plastic bottle needed to be retired, with focus shifted to the tap water itself and multiple ways to serve it. 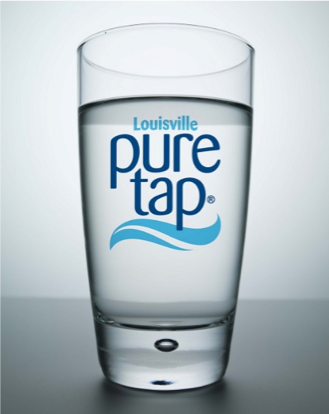 When pure tap® turned 15, in addition to a new logo, Louisville Water refocused on the fact that customers can “bottle their own” tap water anytime using any cup, glass, or bottle. For customers wanting a convenient way to bring Louisville pure tap® with them, Louisville Water Company introduced a new, sturdier, and reusable container. Visitors and participants to the region now find compostable Louisville pure tap® cups, mobile water stations, and 5-gallon coolers, while branded fountains and bottle refill stations are located throughout the city. Now, in 2018, the campaign reaches over 1 million people annually through community festivals and sporting events, as well as targeted outreach—including at over 100 schools where students learn some of the science behind Louisville’s award-winning drinking water. The utility’s WaterWorks Museum, located at its original pumping station, tells the century-old story of Louisville Water’s groundbreaking research in water treatment, chlorination, and infrastructure renewal that brings Louisville pure tap® into homes today. We talk a lot about the “value of water” because we want the public to better understand its full cost, including collection, treatment, and delivery. As Louisville Water Company celebrates the 21st anniversary of pure tap® with a 21-week celebration, the campaign remains at the center of their customer education and outreach efforts, including (of course) social media. And speaking of social media, just search Twitter and you’ll find tweets aplenty from college students reminiscing about how much they miss the taste of their tap water. Over two decades later, Louisville pure tap® still provides an effective platform to highlight the value and public health importance of reliable, safe tap water, and I’m proud to have been part of the unprecedented efforts to trademark tap water. Here’s to another 21 years!